The fascinating, intricate world of DNA is placed under the microscope in Phoenix Artistic Director Sharon Watson’s Repetition of Change. 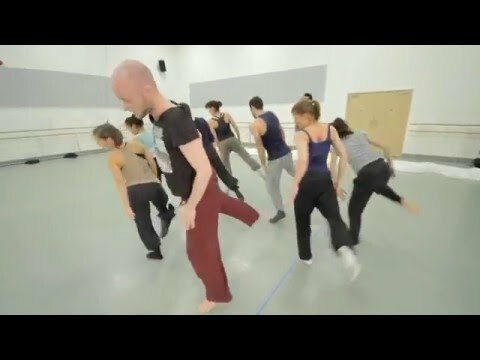 Set to Forms Entangled, Shapes Collided, a specially commissioned score by renowned composer Kenneth Hesketh, this engaging piece uses volatile, impulsive and often sensual dance to unravel the complexities of our genetic code. For performances in Leeds and London members of acclaimed contemporary music ensemble Psappha will be performing this astounding score live, whilst at all other venues the piece will be performed to a specially made recording by the ensemble. The score for Repetition of Change, Forms Entangled, Shapes Collided by Kenneth Hesketh, was commissioned with funding from the RPS Drummond Fund for Phoenix and Psappha. Described by Tempo magazine as "...a composer who both has something to say and the means to say it”, Kenneth Hesketh is a professor of composition at the Royal College of Music and honorary professor at Liverpool University. A student at the RCM, he subsequently attended Tanglewood (studying with Henri Dutilleux) and the University of Michigan. He has received numerous national and international commissions from, amongst others, the Fromm Foundation at Harvard University; the Continuum Ensemble; a Faber Millennium Commission for Birmingham Contemporary Music Group premiered under Sir Simon Rattle; Hans Werner Henze and the Endymion Ensemble (in honour of Henze's 75th birthday); the Munich Biennale; the KissingerSommer Internationales Musikfestival; the Michael Vyner Trust for the London Sinfonietta; The Opera Group; the Seattle Symphony Orchestra; and the Royal Liverpool Philharmonic Orchestra. He has worked with leading performers, ensembles and orchestras including the Sudwest Rundfunk (Baden-Baden), the RLPO, the CBSO, hr-Sinfonieorchester, the BBC Philharmonic, the London Sinfonietta, Psappha, Ensemble Intercontemporain, the ASKO ensemble, and conductors Sir Simon Rattle, Oliver Knussen, Vasilly Sinaisky, Susanna Malkki, Vasily Petrenko and Ludovic Morlot. Hesketh’s chamber music, performed by the contemporary music group Psappha, has been released and will be followed by another disk on the NMC label featuring his large ensemble and orchestral works performed by the RLPO and ensemble 10/10. Future performances include the premiere of a series of twelve short pieces for piano titled 'Horae (pro Clara)' for the British pianist Clare Hammond at the Cheltenham Festival and a work for alto flute for the flutist Helen Wilson. Specialising in the performance of music by living composers and that of the 20th and 21st centuries, Psappha has an extensive and exceptionally varied repertoire of hundreds of works and a reputation for technical assurance and interpretive flair. Psappha specialises in supporting emerging composers, in cross-arts collaboration and in developing new audiences for new music. Becs is the DARE Fellow in Scenography at Opera North and University of Leeds. Recent dance commissions include Faster for Birmingham Royal Ballet, Remote for ROH2, Momo for Ballet:Bern, Terrarium for Simon Birch, and The Art of Not Looking Back and Untitled for Hofesh Shechter. Opera designs include On the Rim of the World and La Serva Padrona for Royal Opera House. Becs recently created 'Phase Revival', an kinetic installation funded by The Royal Society of Chemistry, and Anatomy of a Snowflake, a film shown at Yorkshire Sculpture Park. Future work includes Romeo & Juliet for National Theatre, and Conductor, a virtual orchestral experience.